Side dishes don’t have to be boring. Add some interest and flavor to dinner with these Sweet and Spicy Carrots. They only take a few minutes to prepare then throw them in the oven and let them bake while you finish the main dish. Simple, easy, quick and healthy. I realized recently that I don’t share many side dishes with you all. And that’s because I usually use my time and creativity working on the main dish making the accompaniment an afterthought. And also because I like to keep the side a simple, healthy vegetable as often as I can. I love a simple steamed or roasted veggie but the rest of my crew isn’t always sold because it’s too “plain” or needs a dip (for the love on the dip situation). So I’m trying to mix things up while still keeping weeknight dinners easy, healthy and stress free. In comes these Sweet and Spicy Carrots. I’ve never been a big fan of cooked carrots. They can get mushy and weird and the sweetness is actually not that appealing to me. I guess I like my vegetables bitter…like my soul. Annnnyway, I fully admit that I make what sounds good to me. I’m the one doing the cooking and planning so I naturally lean towards my favorite things. That means carrots don’t hit the table often unless they are raw with a dip or within a salad. But I thought the sweetness of them might appeal to Noah and finally get him to eat a vegetable and if I was careful not to cook them too long, the texture wouldn’t bother me. I have to admit this tactic was a success. Noah ate two, which is better than zero. Hannah takes after me and likes spicy so she liked them. It’s usually not an issue getting her to eat veggies but she’s starting to really listen to what her brother is doing and mimicking him like only a little minion would do. She adores him. I spiced these carrots up with Sriracha. The type I buy is the extra hot stuff so a little goes a long way for us but feel free to add as much as you can handle. For sweetness, I added a bit of honey to the already sweet carrots. A squeeze of lime balances everything out and adds a little fresh zing to the roasted carrots. I chose to roast the carrots in a cast iron skillet to provide some extra caramelization. All that browned goodness provides even more sweetness to the carrots. If you don’t have a cast iron skillet, no worries. Simply use a rimmed baking sheet lined with foil as the honey can be a huge pain to clean off. Roasting them this way makes them fork tender with just a bit of bite. Nobody likes a mushy carrot. I have to say though, my favorite thing about these carrots is that they take the same amount of time and effort as those simple roasted veggies I was doing before (and still love) but it makes things a bit more interesting and different enough to get everyone interested again. 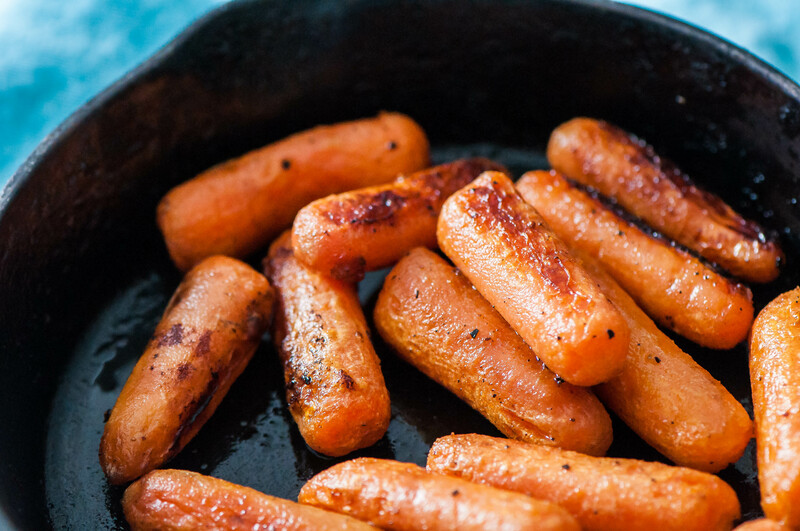 Preheat oven to 425 degrees F. Place baby carrots in single layer in a cast iron skillet. If they are overcrowded use two skillets. If you don't have cast iron skillets, use a rimmed baking sheet instead. In a small bowl, whisk together the remaining ingredients. Drizzle over the carrots and toss until completely coated. Bake for 30 minutes, shaking the pan halfway through.